(China Glass Network) Dedicated to introducing China glass brands to the world and facilitating more China glass brands to enter into the global stage, China Glass Network officially launched the 6th China Glass Brands Appraisal (Hereafter called the 6th “Golden Glass Award”) on 18th November, 2018. Well-known as the Oscar Award in the China glass industry, Golden Glass Award is successfully held for five times. Being 40 years since reforming and opening policies conducted, China glass industry has been transforming from “Made in China” to “Intelligently Made in China”; from “Chasing” to “Leading”; from “Surpassing” to “Extraordinary”, which a new chapter in China glass development history is created by our own hands. Accompanied by economic globalization and Industry 4.0, China glass industry is facing tremendous challenges as well as opportunities. Innovation is the key to sustainable development. For recent years, some Chinese enterprises create and upgrade their own developing methods, wherever from R&D, capital operations, running mechanisms, think tanks, after-sales services, etc. Staying on ceaseless innovations, leaders, entrepreneurs, craftsmen, experts, as well as the young generations from 1980s and 1990s in China glass industry altogether ensure the China glass industry to steer ahead. 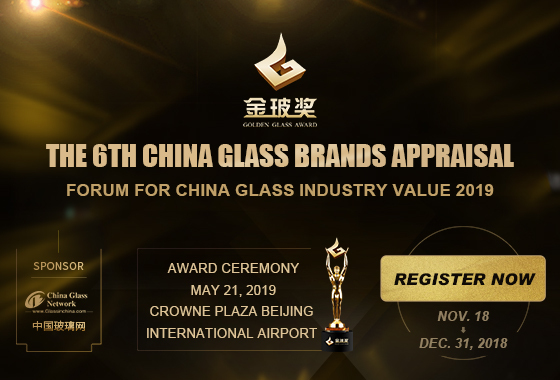 Golden Glass Award sponsored by China Glass Network is an annually public benefiting event, which is free of charge during the whole evaluation process. Firmly upholding the principles of “Opening, Justice, Equality and Charity.”, the 6th Golden Glass Award is composed of total 15 awards, which are categorized as enterprise, product and personal contributions and nominees will be checked and appraised through qualification checking, internet voting, buyer evaluating, experts reviewing, and comprehensive assessing. Now please kindly follow us to have a general view of Golden Glass Award. Top 10 innovative brands respectively for Sheet glass, Decoration glass, Appliance glass, Construction glass, Glass products, Glass chemical accessories/materials, Glass machinery tools, Glass machinery equipment, One Belt and One Road Pioneer, Young promising enterprise, Craftsmen enterprise. Organized by China Glass Network. China Association for Silk Printing, China Chamber for Glass Circulation, China Modern Glass Academy, Hebei Ceramics and Glass Association, Management Committee of Hebei Shahe Development Zone for Economy and Technology, Shahe Zehui Exhibitions, Guangzhou Glass Exhibitions, Zhejiang Province E-commerce Promotion Association, Hangzhou E-Commerce Association, Material Branch of China Construction Industry Association, Designers Alliance, etc. Domestic media: China.org.cn, China.com, Tencent Home, Sina Home, Netease Home, Sohu Home, Ifeng Home, PChouse, Fang.com, Yicai Global, Aluminum.com, Bmlink.com, WYW.com, Alwindoor.com, China Construction Decoration Network, Buildings Windows & Doors and Facades, World of Windows, Windows Exhibits City, News Alliance for China Enterprises, Fengshang Media, Xincailiao.com, China Auto Materials Network, Glass Magazine, Windows Magazine, Asian Financial News, Menye.com, China Building Materials News, etc. Foreign media: German GlassGlobal, Italian Glassonline, Spanish Vidrioperfil, Indian Glass Bulletin, Indian GHA INFO., etc.